Editor’s Note: Regular readers know our go-to tech expert Jeff Brown as a Silicon Valley insider with nearly 30 years of experience in the field of high tech. So when Jeff uncovers a new technology investing trend, we share his insights with Diary readers. Nine minutes into the second quarter, Houston Texans’ quarterback Tom Savage was pounded into the ground by a San Francisco 49er. As Savage rolled onto his back, he appeared to seize up and convulse. His hands began to tremble and one of his legs was suspended in the air – telltale signs of a concussion. Yet minutes later, Savage was right back in the game. However, after two incomplete passes from Savage on the next drive, possession changed to the 49ers. There was further discussion about Savage’s condition. He tried to stay in the game… But fortunately, he was sent to the locker room for further evaluation. That decision very likely saved his life. Receiving a second impact to the head after receiving a concussion can be far more severe. It can even result in death. This is why understanding whether or not there’s been a concussion is so important. But the NFL’s concussion protocol is far from conclusive. There is no definitive way to tell whether or not a player has a concussion. And that’s led to some serious long-term health problems for these players. You may have seen headlines in recent years of high-profile football players dying from complications resulting from chronic traumatic encephalopathy (CTE). CTE is a neurological disorder that results from repeated head injuries. It leads to behavior problems, dementia, and eventually death. A recent study found a strong link between professional football players and CTE. The results were conclusive. The brains of 111 recently-deceased NFL players were analyzed. CTE was found in all but one of them… That’s 99%. As a former all-state football player in high school, and the father of a third grader in his first year of tackle football, this worries me. CTE can only be diagnosed after death, and the symptoms typically begin years after the injuries have occurred. We can’t see the larger problem caused by these concussions until years after someone has already experienced the original trauma. But there is a new technology that allows doctors to identify a condition like CTE years before symptoms present. Our inability to precisely measure the present state of the human condition is a major weakness of the medical system. Even today, physicians react to symptoms they see, rather than proactively identifying early indications of disease or unhealthy imbalances in a patient’s physiology. The scale of this problem is hard to overestimate. According to a British study, 10,000 people die of cancer each year in Britain because they’re diagnosed too late. And that’s just cancer. The trends are similar for conditions like HIV, Parkinson’s, and strokes. 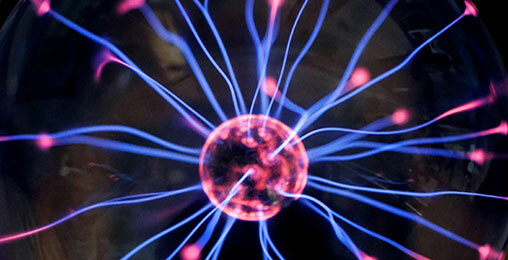 But thanks to one rapidly developing medical trend, that’s changing. I’m referring to personalized, or predictive, medicine. In recent years, scientists and doctors have begun using complex machines to run immunoassays and identify “biomarkers.” These biomarkers provide early indications of diseases like cancer and HIV, or conditions like a concussion or inflammation. The process of using these machines for diagnoses is like testing a patient’s blood for cholesterol levels. In other words, this technology takes something as complex as identifying early signs of life-threatening diseases… and makes it as simple as a common blood test. The technology being used is, on average, 1,000 times more sensitive than the diagnostic tools being used today. That means doctors will be able to diagnose a disease in its earliest stages, sometimes years before the symptoms present. Here’s a backdoor way to profit from this shocking story… without having to buy a single cryptocurrency. The Center for Disease Control and Prevention estimates that 75% of the nation’s healthcare spending goes to treating chronic diseases like cancer, diabetes, and heart disease. All of these diseases can be treated much more effectively, and at a much lower cost, when detected early. The cost savings of personalized medicine will mean that insurance companies will begin to cover these immunoassay screenings. After all, the insurance companies know that detecting a disease early means they have to spend less on healthcare down the road. We’re already seeing this happen in a similar diagnostic technology: genetic sequencing. 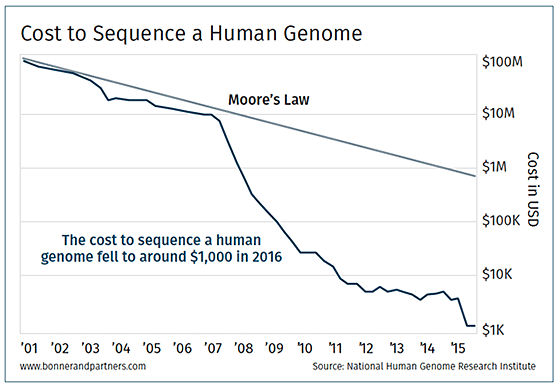 As I’ve shown you in the past, the cost to sequence – or blueprint – your genome (entire genetic makeup) is falling rapidly. 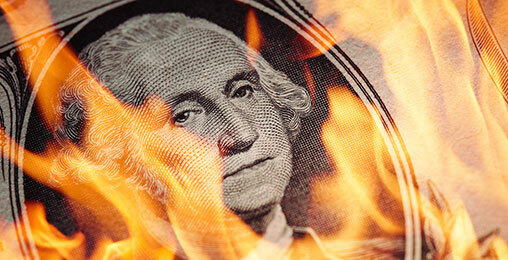 From $10 million as recently as 2008, the cost has dropped to about $1,000. Soon, it will cost just $100. Overall, this progression is far faster than that of Moore’s Law, which accurately predicted that the processing power of microprocessors (semiconductors) would roughly double every two years. Now, unless you’ve been working in the technology sector for a few decades, it might be hard to grasp the significance of this. But I’ve worked as a high-technology executive for 25 years. So take my word for it, nothing in the world of technology to date has developed this quickly. In other words, if a physician knows something is wrong with a patient, but can’t figure out what it is, UnitedHealthcare will pay to have the patient’s whole exome sequenced. The same thing will happen with these ultra-sensitive diagnostic tools. Your insurance company will happily pay for them if it means earlier detection and treatment. What will the effects of this technology be? With this new technology, patient treatment will shift from a reactive, symptom-driven model to a proactive, predictive model. No longer will patients experience symptoms, go to the hospital feeling sick, and have a doctor treat them based on those symptoms. Instead, the patient will have an extensive medical history – and outlook – determined by predictive diagnosis. The onset of disease will be determined at the earliest stages, when the symptoms are not at all felt by the patient. And therapies will be applied quickly before the condition worsens. This is when disease is easiest to treat. That means we will live longer… with less disease and pain. We’ll also spend much less time in hospitals than we do today. And it’s very likely that we’ll live well into our hundreds, thanks to this technology, and even have a high quality of life as we do it. Life is going to get much better. And this shift is happening right now. This is exactly the kind of inflection point that leads to exponential gains, and precisely what I look for in my research. Predictive medicine has long been the ultimate goal for doctors and hospitals – being able to “see” something wrong before the symptoms present, and then take action to address that condition before it ever becomes an issue. Now, it’s fast becoming a reality. A small company in North Carolina is hard at working developing a component that will help this tech go mainstream. From my analysis, I believe the share price for this small-cap stock could climb 10 times in the years ahead. See for yourself right here.